I’m continuing to experiment with my embellisher, trying to learn new tricks. 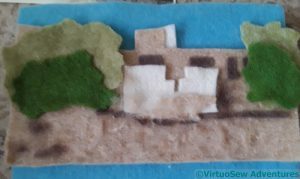 I’ve found a photo of the Dig House from a different view to the previous one I tried, and cut out some pieces of felt to represent the trees and the various pieces of building. 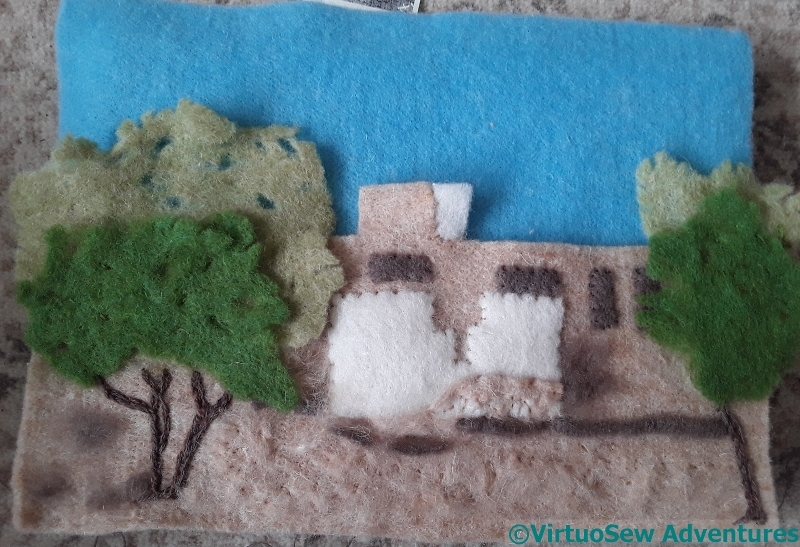 It’s not going to be a very accurate representation, because, firstly, my cutting wasn’t as accurate as it could have been, and second, I’ve found that needlefelting doesn’t always go to plan. That said, a bit of stitchery helps to keep the pieces at least approximately in place. I felt the felt of the trees looked a bit too solid, and snipped holes in it, snipped the edges, and then tugged and tweaked at it to open up the fabric. Then I started to use my embellisher. And oh joy, a needle broke! I changed the needle plate and slowed down a bit after that. It turns out that three layers of even this fairly light felt are a bit much for the machine. However, after much slow and careful embellishing, I have this. The trees look much better now, with the edges and the holes satisfactorily destroyed and battered around the edges. The various layers of felt are melting into one another and flattening together. This should at least provide me with an interesting basis for further stitched details! Personally I like it. Have fun experimenting! The edges get so much softer when needlecelted. The trees look really real and the sky sets everything off beautifully. You can feel the heat. Love the ways the trees have the blended colors! Wow, those trees look fantastic! 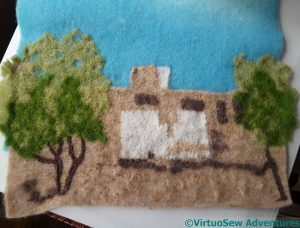 Never tried any needle felting myself, but it is a joy to see you do it. I have never tried needle felting before so it interesting to see you posting, I do those trees. You are getting better with this tool each time you use it. I like the trees. Oh! the joys of finally working out the conundrum! I’m quite fascinated by your experiments with needle felting and the embellisher. I’ve always been a little intimidated by them to give them a go, and haven’t been sure what image I would portray. But this is looking lovely, and I love the way you make it sound so easy to adjust things like the trees! Very nice composition. Believe with some stitches would be lovely.